On Wednesday night I tuned into join Ailish's (The Glow Getter) Organic Beauty Week Google Hangout with Sarah, the owner of Skin & Tonic London. It was really fun to hear all about Ailish's experience with organic beauty and why she chooses to use organic and also to hear from Sarah herself & more about the brand. Sarah was finding that every time she picked up a skincare product, she was checking the ingredients list and didn't know what most of them were. She left her job in TV, trained in Aromatherapy and Skincare Formulation for three years, then convinced her boyfriend Josh to team up with her and create their own skincare line. They wanted to create a brand that was organic, sustainable and minimal but still looks good on your bathroom shelf. I think they have done just that! 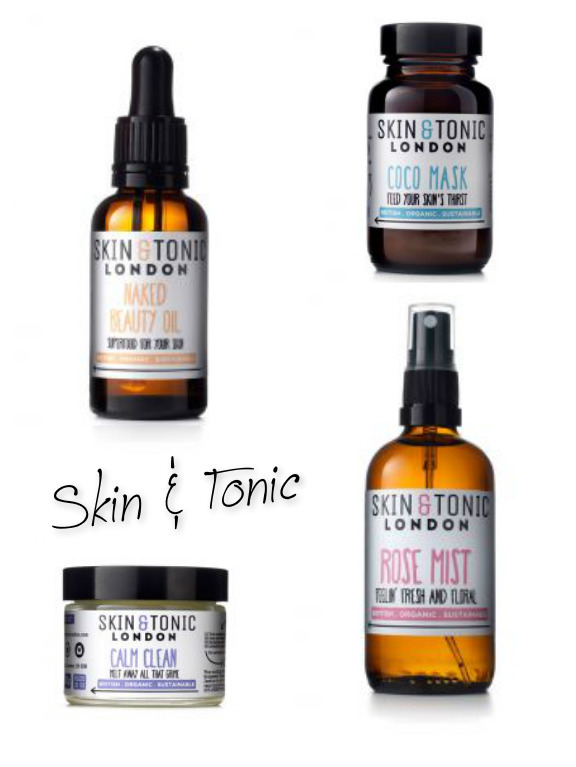 Skin & Tonic is probably the coolest name in organic skincare at the minute and their products are pretty darn good too. My favourites include the Steam Clean & Gentle Scrub. Sarah also told us all about their new releases which are available on Content right now with an amazing offer - FREE Steam Clean worth £11 when you spend £15 on Skin & Tonic products. This hydrating, soothing mask will be perfect now the Winter months are coming around. It is perfect for dry, sensitive and dehydrated skin thanks to the gentle coconut milk powder, aloe vera and kaolin clay. It will gently detoxify skin, whilst hydrating and at the same time, calm you, thanks to the lavender. This balm is a follow up to Steam Clean. It is cleansing balm with lavender aimed at those with dry or sensitive skin, or who prefer a different scent to the Eucalyptus in Steam Clean. It is very gentle on the skin and contains ingredients like Blue Chamomile, English Lavender, Jasmine Sambac oil, Grapeseed and Carrot Root oil to remove dirt and impurities without upsetting the skin. Naked Beauty Oil "Superfood for the skin"
This oil is a follow up to Brit Beauty Oil and is perfect for those with sensitive skin as it contains no essential oils. It has soothing oils like rosehip, raspberry seed, apricot and pumpkin to help both dry skin and those prone to acne. Rich in Vitamin A & C and zinc make it perfect for everyday use or just once a week. You can even use it on your body to help stretch marks or scar tissue. S&T have sourced the rosewater from a small farmer in South of France who has built a distillery up in the Alps. It is hydrating, refreshing & contains aloe to help soothe and cool tired skin. This would work great as a toner, a refreshing spritz and also to set make-up. One of their best seller's is my favourite - Steam Clean. As you should all know by now, cleansing balms are my favourite way to cleanse my skin and this smells absolutely incredible. Now that it's colder again, I am looking forward to opening a brand new jar! They still make all of their own products as they want to keep everything handcrafted. As the business is growing, they're bringing people in to help but mostly cooking it all up in their workshop in Hackney. Being fair across the whole supply chain has been integral to them since day one. Everything they use has an impact on somebody, somewhere, the same with any brand so Skin & Tonic make sure they use 100% organic and sustainable ingredients too. They source many ingredients locally in the UK from a small farms in Wales & Sussex, such as calendula, chamomile, lavender and borage. When it isn't possible to source from the UK, for example coconut oil or shea butter, they buy from Fairtrade Women's Cooperatives in Ghana and Sri Lanka which helps the women to buy food for their families and educate their children. They also donate 10% of their profits to Charity Water, which helps provide essential, clean water and sanitation to those in need. You can also find S&T online at Love Lula who are offering 15% off Soil Association certified products until 20th September with code OB15. *This is not a sponsored post, I just really wanted to share everything I heard in the Hangout yesterday!